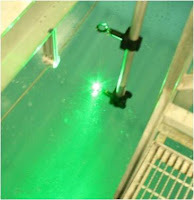 The driving laser pulse has the ability to travel through both air and water, so that a compact laser on either an underwater or airborne platform can be used for remote acoustic generation. Since GVD and NSF effects are much stronger in water than air, a properly tailored laser has the ability to travel many hundreds of meters through air, remaining relatively unchanged, then quickly compress upon entry into the water. Atmospheric laser propagation is useful for applications where airborne lasers produce underwater acoustic signals without any required hardware in the water, such as undersea communications from aircraft. Also, commercially available, high-repetition-rate pulsed lasers, steered by a rapidly movable mirror, can generate arbitrary arrays of phased acoustic sources. On a compact underwater platform with an acoustic receiver, such a setup can rapidly generate oblique-angle acoustic scattering data, for imaging and identifying underwater objects. This would be a significant addition to traditional direct backscattering acoustic data.